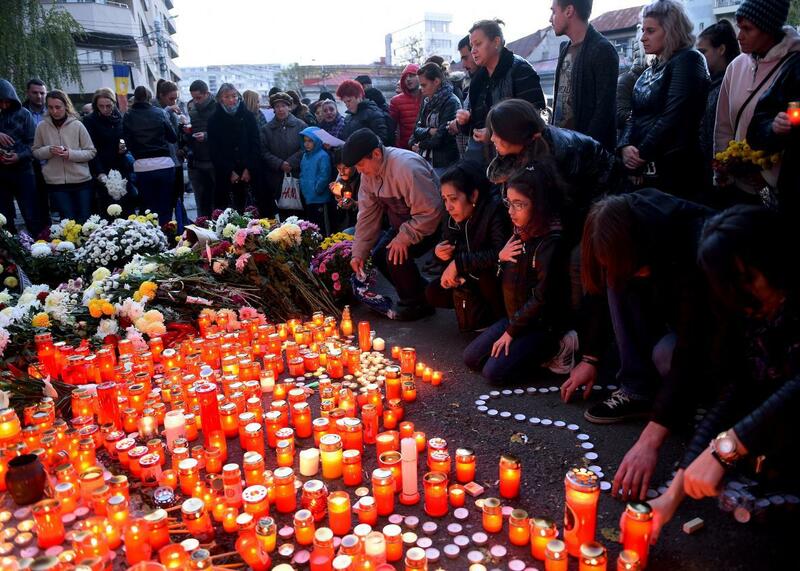 Singer in Romania nightclub made joke about fire before it killed 27 people. People light candles to commemorate the victims outside the nightclub Colectiv in Bucharest on October 31, 2015, a day after a deadly fire. Hundreds of people were attending the free concert by the band Goodbye to Gravity at the hip basement club in downtown Bucharest that was advertised to include “pyrotechnic effects.” Witnesses said fireworks were fired off inside the club and that the fire spread quickly. “In five seconds the whole ceiling was all on fire. In the next three, we rushed to a single door,” a young woman who only suffered minor injuries told a local television station after she was released from hospital, reports Reuters. A criminal investigation has been launched. Authorities say the death toll is likely to raise as many of those injured are in critical condition. One member of the band died and another is in critical condition, according to local reports. Shock turned into solidarity on Saturday as long lines formed at blood-donation centers, reports the Guardian. Prime Minister Victor Ponta cut short a visit to Mexico to return to the country and declared three days of mourning. He has called on authorities to verify that all the nightclubs in the country comply with safety standards. “I am outraged that such a tragedy happened right in the center of Bucharest,” President Klaus Iohannis said Saturday after he visited some of the injured people in hospital, reports Bloomberg.